Most people know WGBH as public broadcasting in Boston. As a $200 million dollar non-profit institution, WGBH is in fact several things: the producer of over one third of the programs you enjoy on PBS and NPR (including on tv: NOVA, Frontline, The American Experience, Antiques Roadshow, This Old House, Arthur, Between the Lions and Zoom; and on radio: The World, Says You and Sound and Spirit); a publisher of extensive educational outreach materials in print and on the Web; and a trusted local cultural resource in Boston with over 200,000 members. 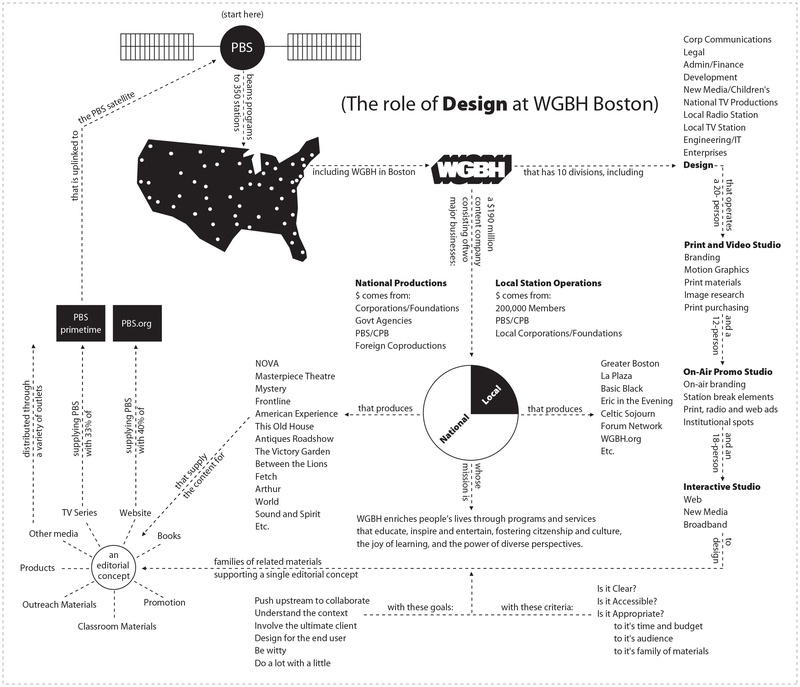 Design has played a key role at WGBH since its early days and has been supported at the Vice Presidential level since 1973. The role of the design group is twofold: to provide professional, creative and cost effective design services that are required by our business; and to help define, through the things we make and the nature of our collaboration with others, the visual personality of the company and the character and effectiveness of its editorial products and services. The size of the group has grown from 5 in 1973, to over 50 in 2008, driven by the huge expansion of design media since the mid-80’s, and the parallel growth of the business as a whole. In 2002 I began to think of how to visually describe the way design fit within the whole enterprise. The result was this diagram, a kind of concept map. Begin at the PBS dot. The diagram shows that a major responsibility of the group is to create a range of realted materials that area all in the service of a single editorial concept. Because of the nature of our business we have been obliged to produce work that is both eclectic and coherent: eclectic in the sense of reflecting the unique content and voice of each program or communication, rather than applying a “house style;” coherent in the sense of being sensitive to the “family” of materials into which each piece must fit, and in the larger sense, upholding the level of quality and clarity that should characterize all of WGBH’s work. Design is part of a larger enterprise whose mission is to “educate, inspire and entertain” and to promote and an active and engaged citizenry. Over the years, the existence of a stable and responsive design group, made up largely of individuals who are personally committed to this mission, has been an asset to our business and has helped make WGBH a leader in public media.